We all know Halloween in the U.S. I certainly don't need to explain. I won't be there this year, and I wonder what, if anything, it'll be here in Paris. However, until I saw this at the Monop grocery store today, I hadn't given Halloween a second thought, or even a first thought. 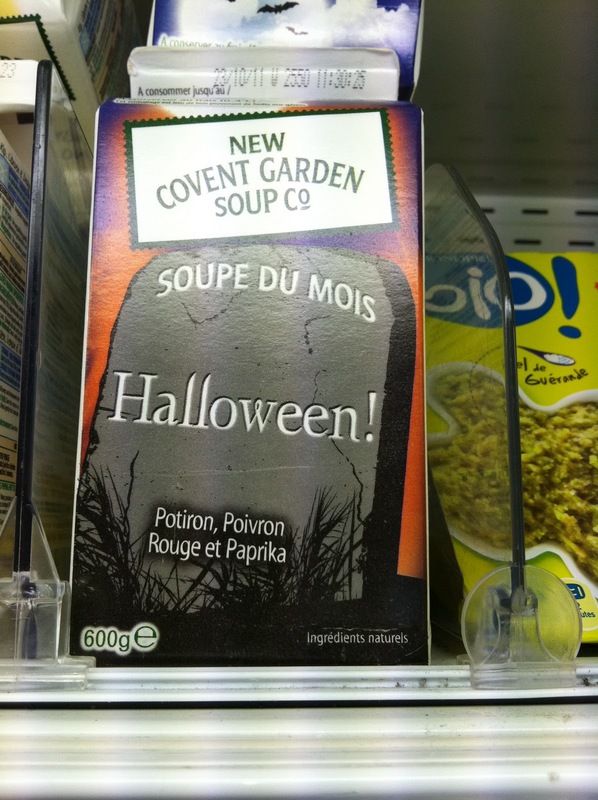 "Soup of the Month - pumpkin, red pepper and paprika"
Would anyone really be tempted to buy a black container of soup with a tombstone on it? What marketing genius thought of that? And why? And who could the target audience possibly be? Fill it with candy, take it off the top shelf of the refrigerated case, put it on the lower shelves of any aisle, and then you'd have an audience - kids (assuming they know anything about Halloween). Rain rain (will NOT) go away!